Have you ever wondered what happened to the middle ranking characters in Shakespeare plays ? If it’s a comedy, the principal characters get married- Beatrice and Benedick, for example. And if it’s a tragedy, they die- Hamlet in a duel, Macbeth in a brawl, Lear of shock and old age. But what about the characters left behind. What kind of a marriage do Sir Toby Belch and Maria have ? What happens to Seyton ( or is it Satan ?) Macbeth’s sinister bodyguard ? Does Horatio just go back to being a university don after the death of his friend ? 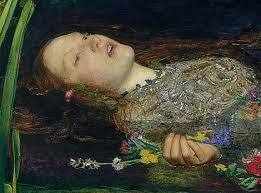 I’ve been thinking about Rosaline, the girl Romeo is passionately devoted to- at least until he meets Juliet. What happened to her ? And just suppose Romeo didn’t die of poison after all and….just suppose it all happened in the 21st Century…just suppose…. Have a look at this poem and let me know what you think…. ten years ago but still he kept the name. I wish he wasn’t so fastidious. childhood sweet hearts you might almost say. for thirty years have gone and I’m not prone to hate. of red gold sparks where mine was merely black. that everything he said, he meant. I shudder when I think of it. of therapy at that clinic in the Alps. Then he was good as new- almost. We married- it was a kind of reflex action. He’s gentle and considerate-. Separate bedrooms. That side of things was always a formality. and I pretend a placid ignorance. to our only child- a daughter. but I refused. She has my mother’s name. the house is left to me- it’s my domain. A cook and gardener see to all my needs. and fly off to the Maldives every summer. Oh, good God, this is PERFECT!!!!! Thank you so much for that- and the reblog ! Shakespeare is a good starting point for any poet- you can play around with his ideas. I’m thinking of doing something on Isabella in ” M4M- there are som many modern resonances there. Many thanks again for your encouraging comments.You’ve made my day. Oh, please to that! Measure for Measure is playing at our outdoor venue in a few weeks. Thank you KB- glad you liked it.